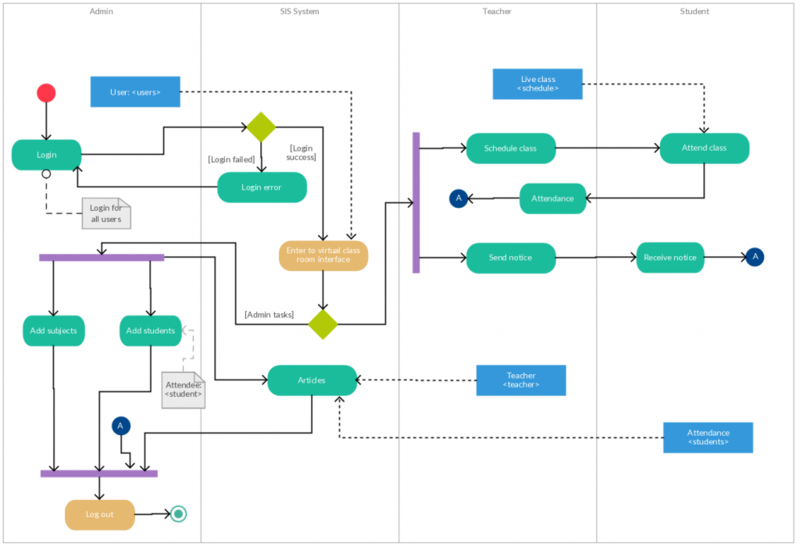 UML activity diagrams represent workflows in a graphical way. They can be used to describe business workflow or the operational workflow of any component in a system. Sometimes activity diagrams are used as an alternative to state machine diagrams. 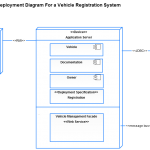 Check out this wiki article to learn about symbols and usage of activity diagrams. 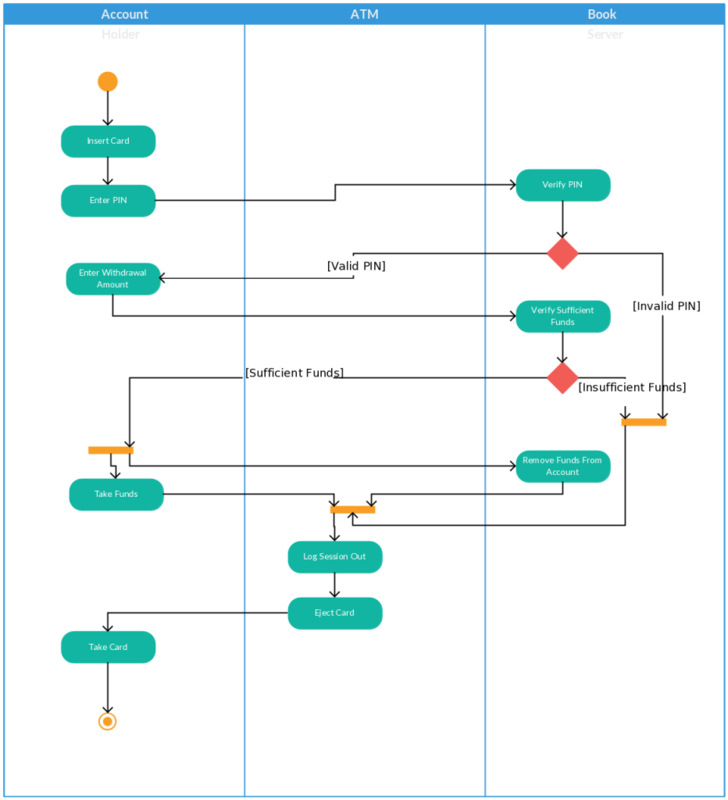 These activity diagram templates cover most of the popular workflows out there. Click on the image to modify online or right click to save them as images. 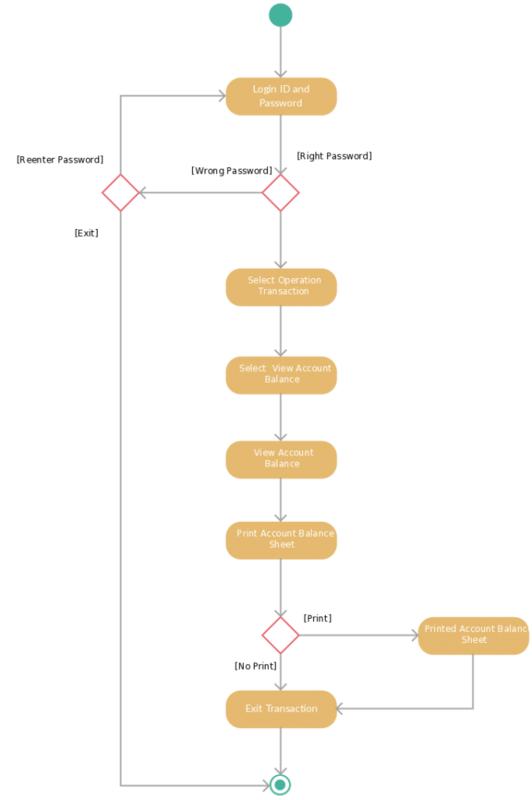 A simple activity diagram example for cash withdrawal workflow from an ATM. The familiarity with the scenario makes it a good starting point to learn about activity diagrams. Just click on the image to modify it online using Creately UML tools. 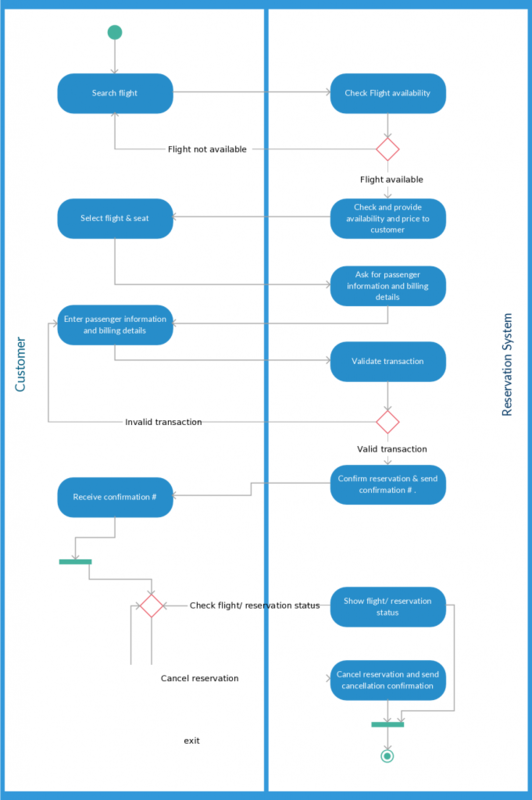 The following activity diagram template illustrates the more complex scenario of booking the flight tickets online. The workflow involves only 2 subjects, but you can expand it further to include more subjects to reflect a scenario closer to the real world. To expand the diagram by adding more subjects/events, simply click on the image. An activity diagram template showing an online banking system. This workflow illustrates checking the balance online. You can use this template and expand it to show fund transactions, utility payments or any other relates services. This activity diagram template for a college management system involves many subjects. Management systems differ considerably from college to college, but you can use this as the starting point since it covers the basic functions. This scenario covers a college that offers online courses via virtual classrooms. A real world scenario is definitely more complex but breaking it down different activity diagrams can help to make the diagram more effective. You can modify this to include in house course management, affiliate university management, and many other scenarios. This template shows borrowing books workflow from a local library. This is an essential part of any library management system. However, there are many other workflows in a library management system. 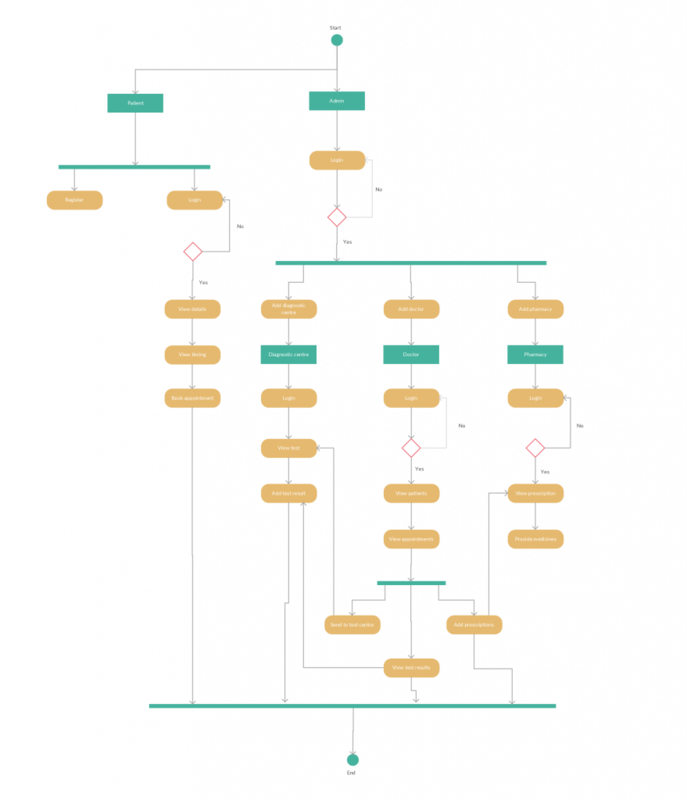 You can either edit this activity diagram or simply create a new one for that scenario. The activity diagram template below shows a hospital management system. It only covers the patient registration workflow and the administrator activity workflow. A complex system like a hospital obviously has many other workflows. Click on the image to modify online, and to add different levels of the hospital management. 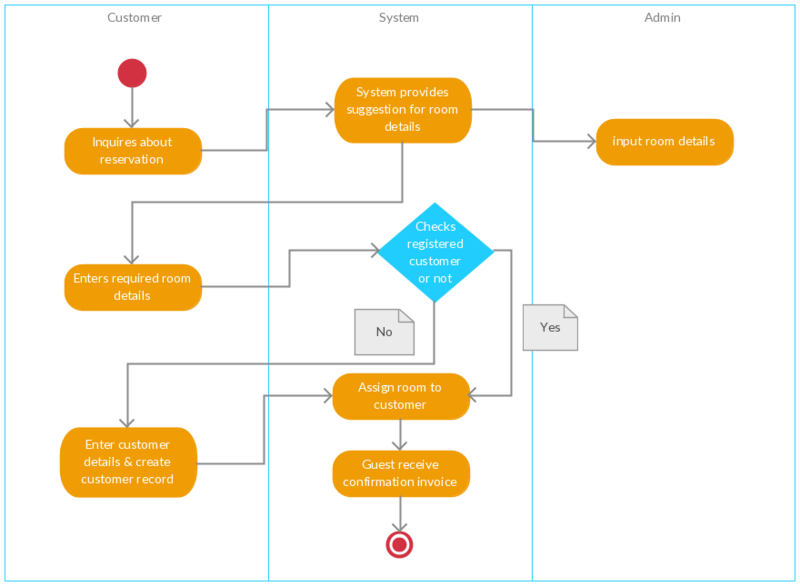 This simple activity diagram illustrates the scenario where a customer is booking a room. This flow involves 3 subjects and the breakdown of the flow for each one. You can amend this scenario by directly modifying this template. 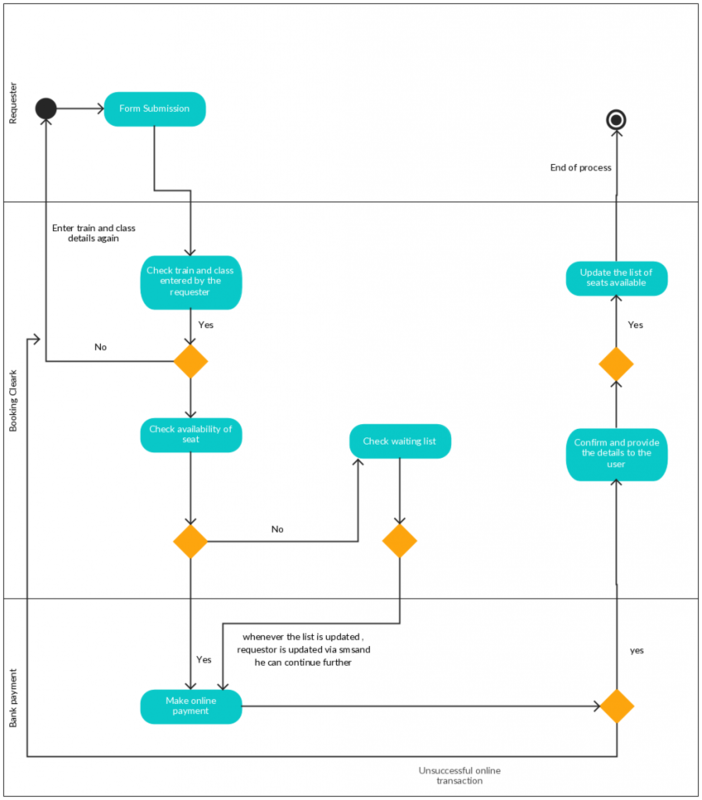 An activity diagram template for a railway ticket reservation workflow. 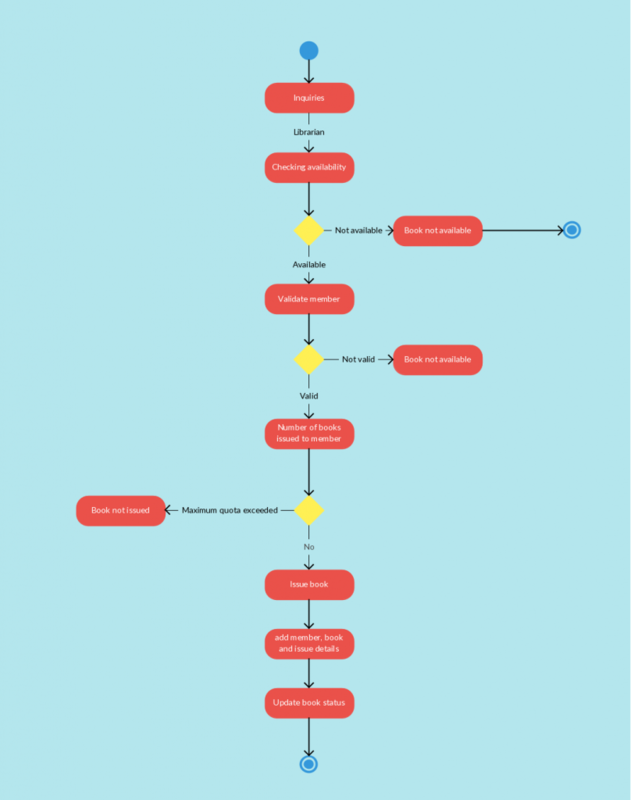 This flow presents the subjects involved in the system and the process of booking. You can use this template to create similar scenarios like, booking bus ticket, booking taxis and other transportation. Click on the image to modify online. 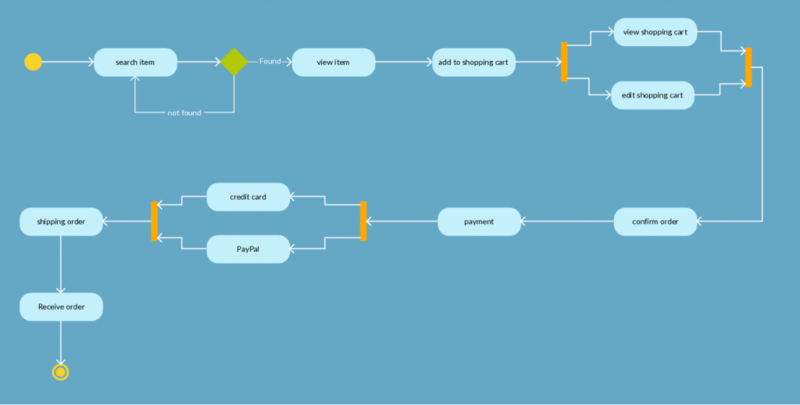 This activity diagram template shows the flow of an online shopping experience, from browsing the store to checking out your cart. You can create similar scenarios using this template in Creately. Click on the image to get started. 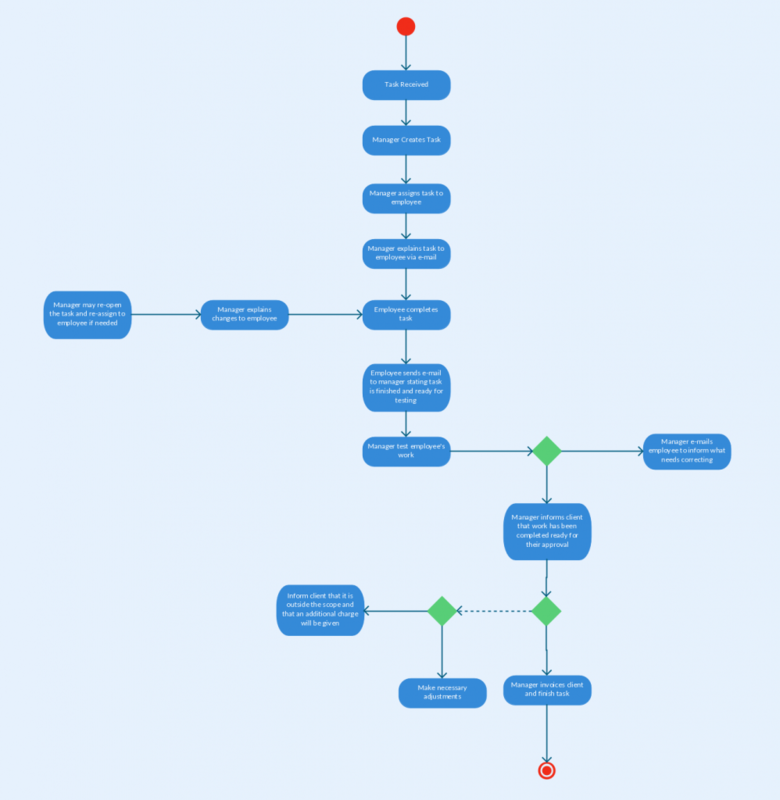 An activity diagram template to show a project management by a manager. This diagram shows the manager’s perspective to manage a project with the process flow. You can relate this scenario to you or you can make some changes and create your own. Click on the image to modify now. With this diagram template, I would like to wrap up. You can also visit our diagram community to access more activity diagram templates or to search for a particular activity diagram. Also, please stay tuned with our example posts category for more and new example diagrams.